Wholesale Gift display Boxes for Necklaces, Bracelets, Pendants Bangles etc. 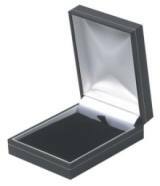 High Quality jewellery boxes in velvet finish, velour, leatherette and highly polished wood materials. Various sizes and styles of gift box packaging for Bracelets, Chains and Nceklaces. Leatherette finish with gold band Black colour Necklace, Pendant or chain box. 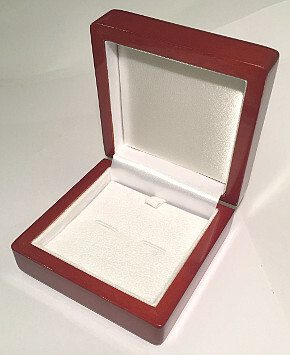 80mm x 65mm x 28mm size necklace display pendant gift box. Includes chain necklace insert display pad. Large Hard Plastic Display Gift Necklace Display Box. 165mm x 160 mm large size. 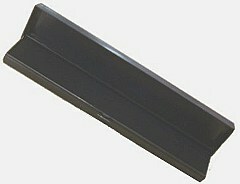 Black plastic finish with black foam insert inside to display chains, necklaces, pendant jewellery etc. 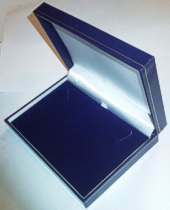 Quality Large hinged Platsic Display Gift Box for Chains etc. 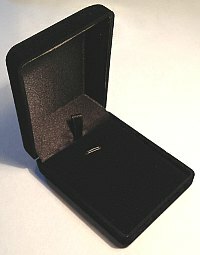 Plastic chain or bracelet presentation display box in black colour. 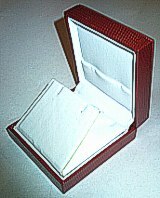 215mm x 40mm x 20mm sized watch, necklace, chain or bracelet packaging gift boxes with foam pad display insert. Large hard plastic box with hinged lid. Plastic Necklace Pendant box with Clear Lid. Large deep size clear top pendant or necklace box. Large Size 80mm x 55mm x 32mm. Option to include Pad insert in Plain White or with Printing 'STERLING SILVER' or '9ct GOLD'. Clear Lid see through plastic Pendant or neck chain gift box. 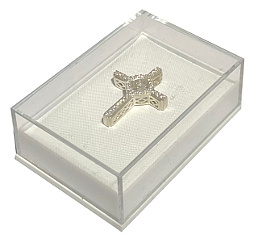 58mm x 40mm x 22mm size gift packaging box for necklace, chains or pendants. Red padded display insert available option. Large Navy Blue Leatherette finish Necklace, Chain or Pendant Box with Velveteen Necklace insert 175mm x 100mm x 30mm Large size. Real Wood Bracelet or Chain Jewellery Gift Display Box,polished finish. approx. size 250mm x 60mm x 40mm. High quality polished real wood Bangle or other jewellery Display Gift Box. 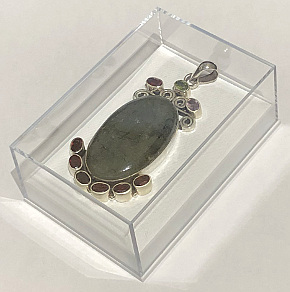 Large square quality box that can be used for cufflinks, bangles, earrings, bracelets and other jewellery items of stock. Black Plastic hinged bangle gift box with foam insert. 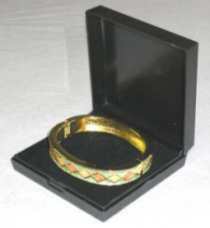 82mm size Quality Bangle or Bracelet gift packaging boxes. Red Necklace/Pendant or Earring Stud Box in Red Crocodile Lizard Skin Textured effect Finish. 58mm x 52mm x 30mm size. Velvet style Black colour Necklace, Chain, Pendant etc. boxes. 60mm x 76mm x 30mm approx. sized necklace display gift box. 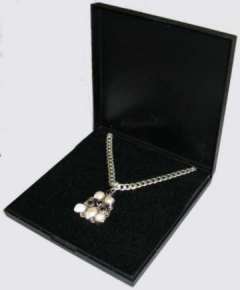 High quality chain or pendant gift box with Black velveteen insert necklace pad. 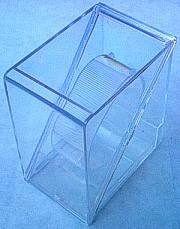 Display Watch Boxes in Clear Hard Plastic material with Watch holder insert, approx. size 85mm x 70mm x 50mm. Large Wooden polished Bracelet or Watch box. Size approx. 270mm x 80mm x 45mm externally and 250mm x 60mm x 28mm internal size. Excellent quality polished wood finish jewellery gift box.